“Every judge I appoint,” said President George W. Bush, “will be a person who clearly understands the role of a judge is to interpret the law, not to legislate from the bench.” He appointed John Roberts, the current Chief Justice of the United States Supreme Court. Sounds good, eh? Who wants activist judges passing legislation? Besides the fact that it is impossible, it is just not democratic. But one thing that courts can do is repeal legislation. It’s not any more democratic, but at least judges can be activists to further an agenda if that’s the kind of judges they are. And that’s the kind of judge John Roberts is. You bet he has an agenda. What’s his game? It’s serving up softballs to the rich and mighty. Arizona Free Enterprise v. Bennett is a perfect example. The State of Arizona through the democratic process of citizen referendum, enacted a law that was intended to “level the playing field” of electoral politics by eliminating the advantage that money bestows upon thems that got it. The system was a model of simplicity. You could get funding for your campaign if you promised not to spend any money of your own. If your opponent started to spend his own money on a campaign, the state would match it up to a limit. Note that your opponent could spend as much of his money as he likes: there’s no limit. The Supreme Court, in Citizens United, held that money is speech and so, ipso facto, the law in no way restricts free speech. Let’s take a look at the curve-ball Roberts court threw the citizens of Arizona. As the income curve in the United States begins to resemble a bell curve less and the grin of a Cheshire Cat more, up go the barrier to entry in diverse fields like, say, politics. Of course, anyone can beg for money to run for political office. But that means that in order to become elected, you have to become, if not indebted, at least beholden to the moneyed class. By a strange coincidence, the opinion in AZ Free Enterprise v. Bennett came down on the same day that the jury handed up a verdict in United States vs. Blagojevich. Before John Roberts was confirmed he made his pitch to the Senate Judiciary Committee. “I have no agenda, but I do have a commitment. 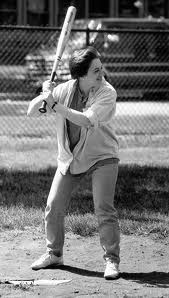 … And I will remember that it’s my job to call balls and strikes and not to pitch or bat.” As it turns out, he threw a knock down pitch at the body politic when he authored a judicial repeal of the Arizona law enacted to prevent corruption and level the playing field. The funny thing is that I don’t much care for a level playing field, either. I prefer a mound 10 inches high, 18 feet in diameter, with the front edge 50 feet, 6 inches from home plate. 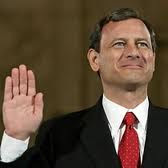 I guess that makes me more like an umpire than John Roberts is.